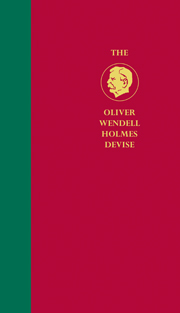 The Oliver Wendell Holmes Devise History of the Supreme Court of the United States is a multivolume history that has been planned to give a comprehensive survey of the development of the Court from the beginning of the nation to the Warren Court. The Press will publish volumes on the Taft Court, the Hughes Court, the Stone/Vison Court, and the Warren Court. Alexander M. Bickel, Benno C. Schmidt, Jr.